As promised, here is the second cupcake recipe for the week. Coconut cake with cream cheese frosting. Super festive and not too hard to execute :) Now go fourth and bake, my friends. Bake on 350 degrees for 20 mins. When I have to dye my own icings those non-pastel hues I end up having to use so much dye and it gets a bit runny so I cheated a little and bought the red and green Cake Mate icings with this four pack of icing tips. 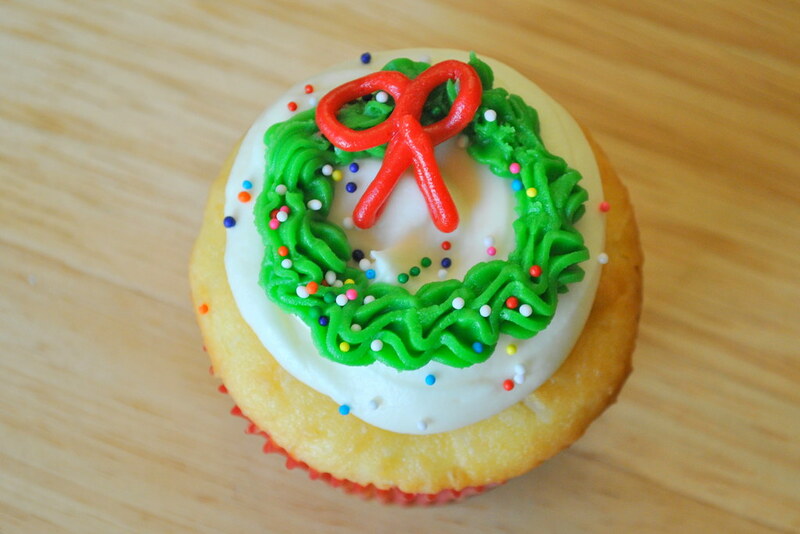 I used the starred one for the green wreath part and the small circle one for the red bow. I threw on some sprinkles but they kinda went all over the cupcake so you can leave that part off if you don't dig it. 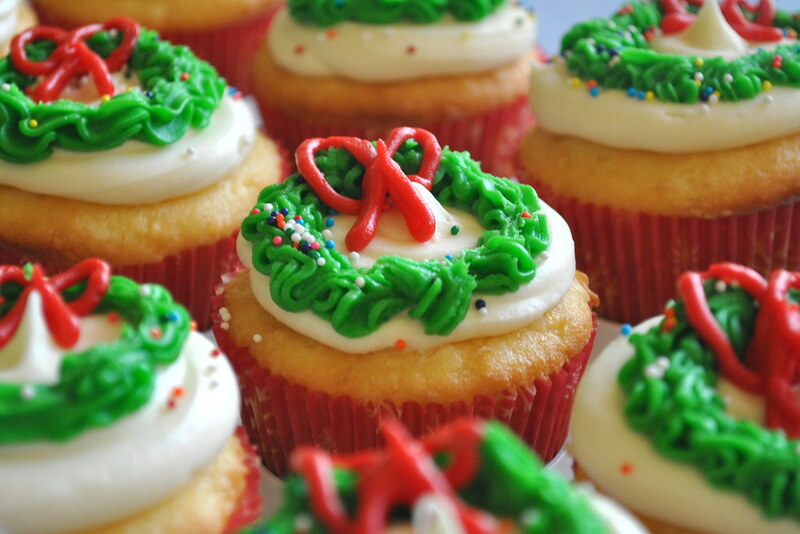 These are the cutest holiday cupcakes I've ever seen! These look great and absolutely delicious. Thanks for sharing the recipe! 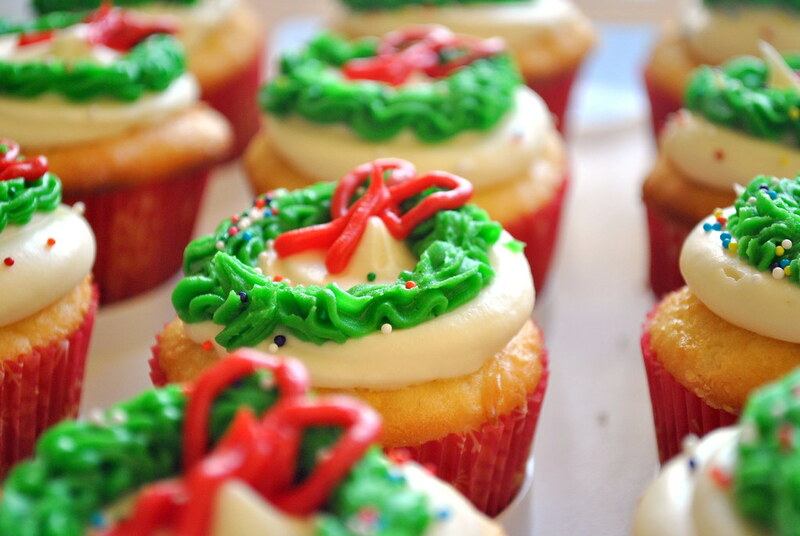 you should open up your own little cupcake shop - these are adorbs! So cute! They are almost too pretty to eat! Cute cute cute! Love the cupcakes! I've emailed you a couple of time, Erin, about 50 States of Brave... Let me know if I need to resend them! Thanks! Another batch of cupcakes? You are like super baking woman! :) Super cute and almost too pretty to eat... but I am sure they were delicious! How cute! Almost too cute to eat.... almost. The meaning of this is that you literally kill fat by eating Coconut Fats (including coconut milk, coconut cream and coconut oil). These 3 researches from major medicinal magazines are sure to turn the traditional nutrition world upside down!